Throughout the 13 years that the Sri Lanka Women’s Swimming Project has been teaching adult women and teenage girls to swim, the ability to keep the airway open at all times has been the single most important skill to be mastered by anyone entering water voluntarily or involuntarily. This requires an individual to master a face-up star float on the back, no matter how they enter the water. Learning this is not difficult but, initially, it does require one-to-one instruction and physical hands-on support from the teacher. The key issue in learning to float is that 95% of the body needs to be submerged in order achieve buoyancy balance that leaves the face above the water. 5% is not a lot of buoyancy margin but it is the difference between life and death. Bringing any part of the body, even a hand or a foot out the water, unbalances the float, causing the face to go under. Worse still, lifting the head out of the water without compensating leg and arm action guarantees that the face, and hence the airway, will sink below the surface. We are absolutely delighted, having ourselves joined the Float-and-Breathe lobby very early on, at one of the Lifesaving Foundation of Ireland’s conferences on Drowning Prevention a decade ago, that one of Britain’s foremost and famous charities, the Royal National Lifeboat Institution, should flag-up floating as the first survival action to be taken on unintentionally entering water, especially cold water. The RNLI has produced the following video clip, which is a MUSTSEE fot every man, woman and child in this planet. 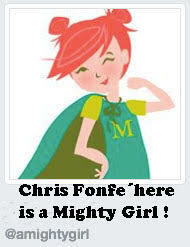 Click on the link below to see this short but important video message. Interestingly, Thailand rolled out a national Float-and-Breathe for adults several years ago and now India appears to follow suit. 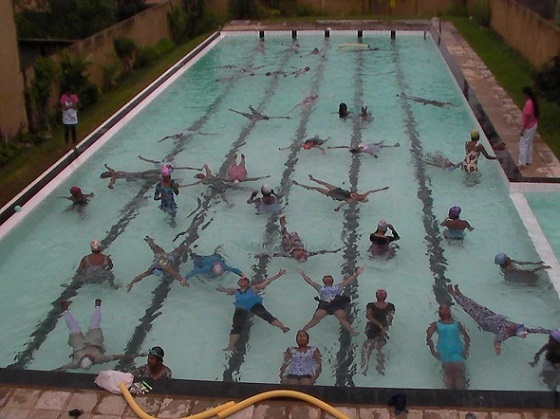 Having taught hundreds of children and thousands of adults to Float-and-Breathe first, and then swim, in our Sri Lanka Project, we are amazed at the number of parents and good strong swimmers, back home here in Britain, who tell us that they cannot float, often claiming that they are too thin, or too heavy-boned to float; this is hydrodynamic nonsense. If the Back Star Float is taught first and absolutely mastered in all conditions, even before stroke in the learn-to swim process, the two immediate benefits are survivability and self-confidence in water. The further benefit is that progression to stroke is both efficient and easy because student balance and guaranteed breathing have already been mastered. Sculling head-first and then feet first reinforces this balance and leg-kicking introduces efficiency and streamlining to speed. Back stroke introduces even more efficient propulsion which can be morphed into bi-lateral breathing with three stokes face down, followed by three strokes of backstroke to breathe. The switch from back to front to back, in turn, reinforces core body rotation and hip drive propulsion, as well as eliminating the temptation to screw the head up out of the water to breathe and unbalance established, effortless, streamlined propulsion. All in all, we are delighted that a body as important as the RNLI should take up Float-and-Breathe as a key survival immediate action. Hopefully the major learn-to-swim organizations will recognize the importance of the ability to float over premature concentration on stroke and speed which characterizes their current learn-to-swim certification processes. 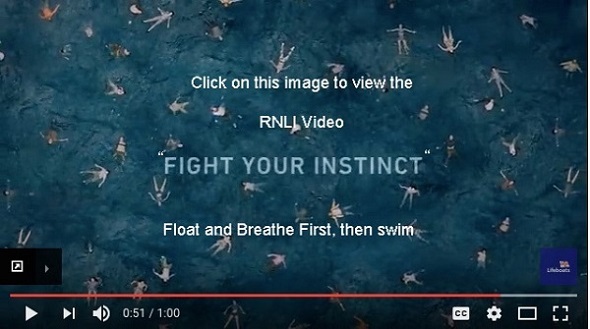 For further reinforcement of the RNLI’s Float-and-Breathe video, it is well worth listening to Professor Michael Tipton’s excellent, simple explanation of the science behind the Float First concept. The Professor ends by urging everyone to practice floating in a pool first – an emergency is not the time to learn a new skill! It should come as no surprise to learn that a swimming pool full of Back Star Floaters is our head caption image on our Facebook Site. Visit us. The link is on every page of our website. Floating is simply a mastery of relaxation and balance control. And, properly taught, is so easy to learn. Do it now.